When a baby is born in a Tamil family, the baby's birth star and zodiac sign are noted and the astrologer is consulted. Astrology is deeply followed by Hindus in Tamil Nadu and they frequently refer to the birth chart before taking major decisions in the life of a person which also includes marriages. At the time of fixing a marriage the birth chart of the prospective bride and groom are matched before they even meet. This is common in almost all Hindu homes across India. In Tamil Nadu mostly names of Gods and Goddesses are chosen, as this deeply religious community attaches importance to destiny in one's life. It is almost impossible to find a person whose name does not have a connection to any deity. 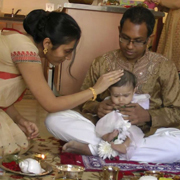 Naming ceremony is held by inviting relatives and a purohit renders mantra – a prescribed Vedic text along with a ritual which the parents have to perform to seek the blessings of Almighty for the newborn. An elaborate meal is arranged on the occasion and relatives shower the child with gifts and valuables. In orthodox families, baby names are chosen after getting the opinion of elders who wish the child all the good things in life. A visit to a nearby temple is the custom after the naming ceremony as parents seek the divine’s grace for their child to progress in life without any major hiccups and troubles. The child sports a radiant look with new clothes and gold chain (and sometimes ear studs) and pampered lavishly by the visitors and parents alike during the naming ceremony. In order to keep the customs and rituals intact, parents narrate to their grown-up children how they were named in a gala ceremony and the nitty-gritty of the intricate ceremony so that they can follow the same custom while naming their progenies. In Tamil society, there are subtle variations in naming ceremony based on caste and regional affiliations which dictate the course of a person’s life. From birth to death, the age-old customs pertaining to caste and sub-regional moorings sill impact one’s life in a subtle and at times in a more direct manner in Tamil society. The first letter of the father’s name is usually taken as the initial for the newborn. But if it is baby girl, then after marriage, she gets the initial of her husband as is the custom in this patriarchal society.